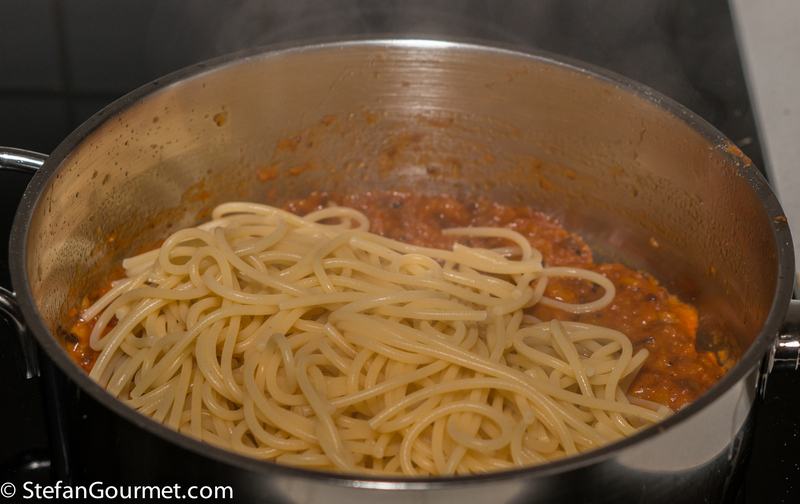 You can of course select the pasta shape that will match your choice of sauce, but in today’s an yesterday’s post I have demonstrated that you can also adapt the sauce to the pasta shape. 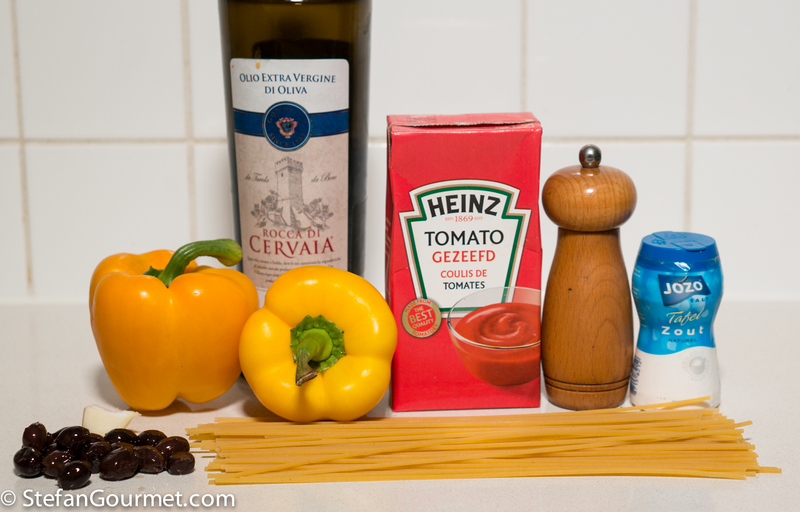 Both dishes use the same ingredients: bell peppers, olives, pasta, tomato puree, olive oil, garlic, salt, and pepper. With the same simple ingredients, you can make two pasta dishes that are both delicious but quite different. 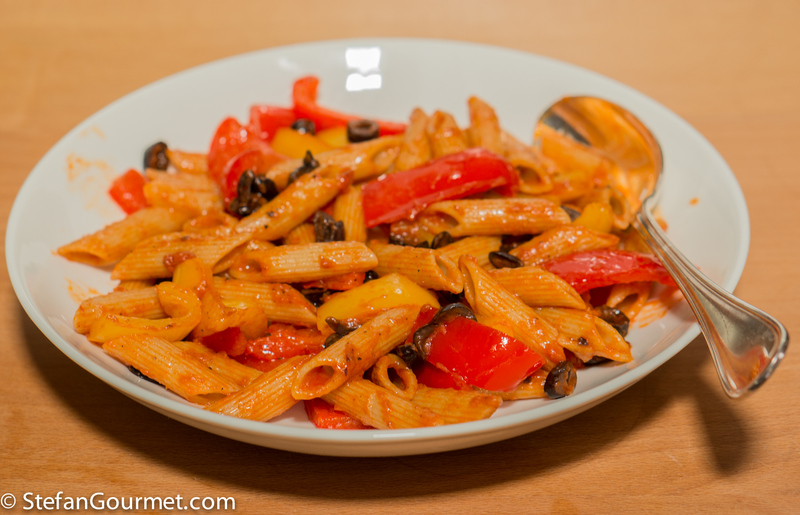 Yesterday’s dish with spaghetti tastes very differently from yesterday’s penne. 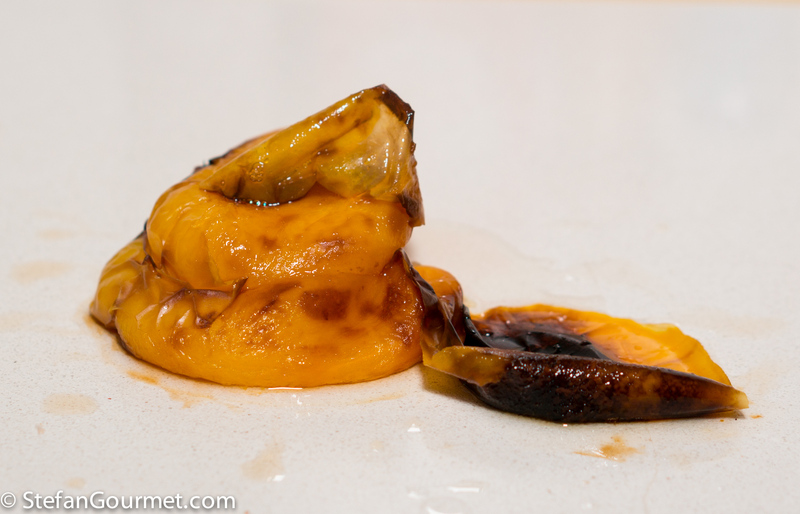 This is in part due to the different mouthfeel, and in part due to the flavor added by roasting the bell peppers. 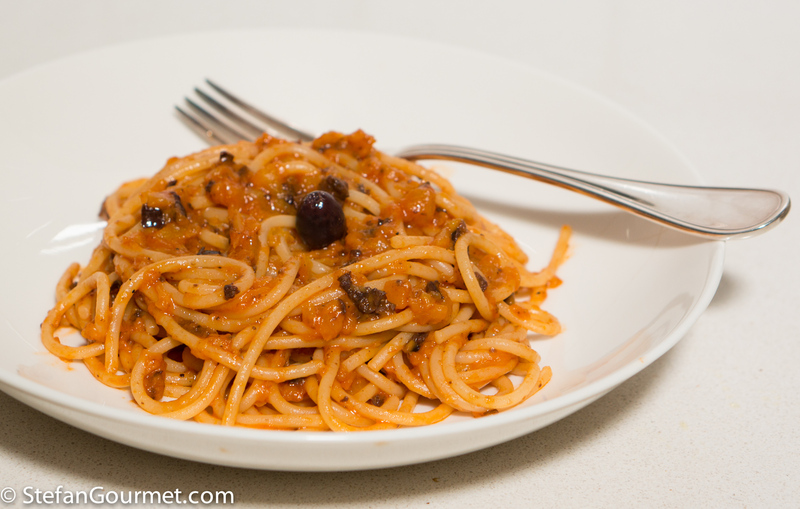 Although both dishes are good, Kees and I both preferred the spaghetti version. Preheat the oven to 250C/480F. 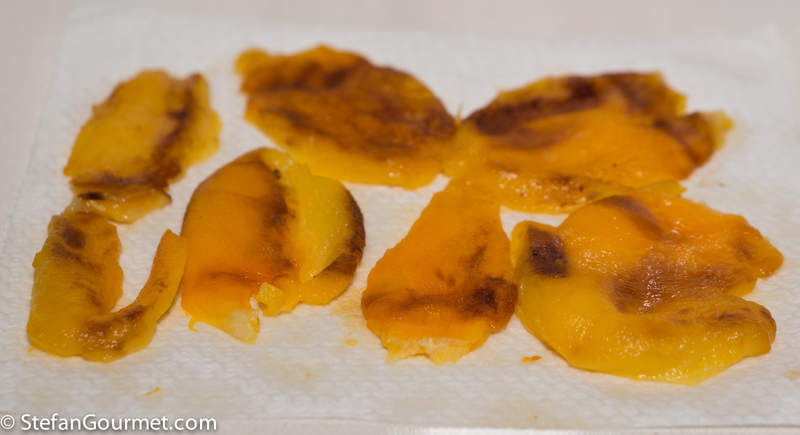 Roast the bell peppers at that temperature for 25 minutes, or until well browned. 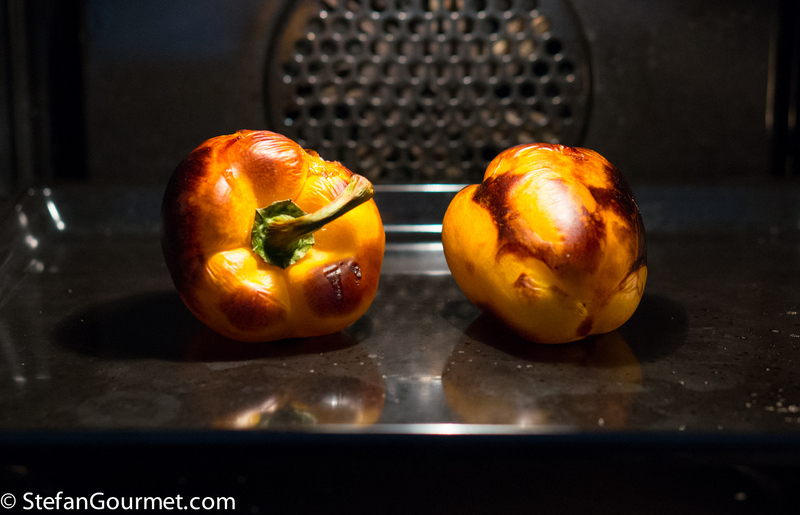 After roasting them, put the bell peppers in a closed plastic bag to cool off. The steam will help to loosen the skin. Meanwhile, bring a pot of water to a boil. When the water boils, add salt and 150 grams of spaghetti and set the timer for the time indicated on the package for al dente. 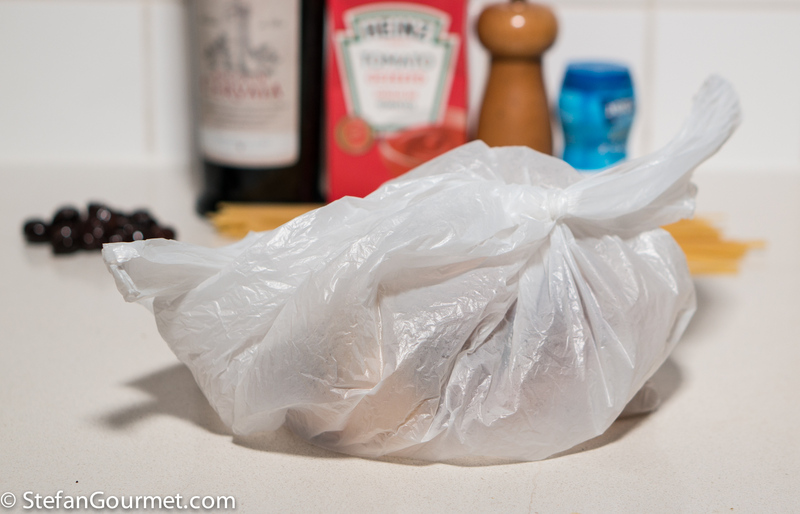 Once the bell peppers have cooled off inside the plastic bag, the skin should then come off easily. Skin the bell peppers and pat dry with paper towels. 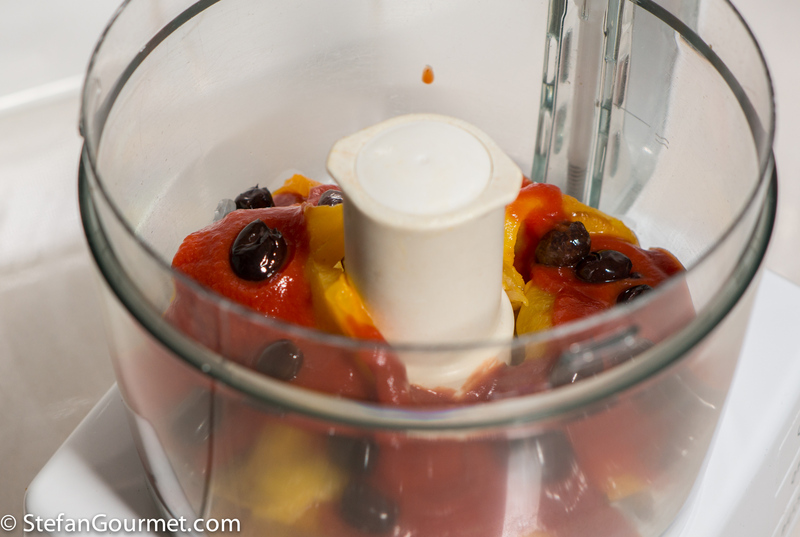 Put the bell peppers in a food processor with 25 grams of pitted black olives and 90 grams of sieved tomatoes. 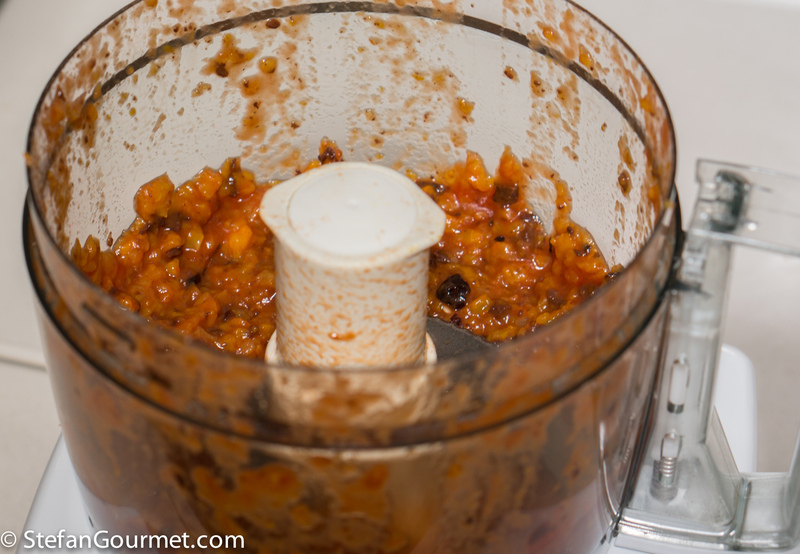 Pulse as many times as needed to get a coarse puree. There shouldn’t be any large pieces left, but it shouldn’t be smooth either. Heat 2 tablespoons of olive oil in a frying pan. 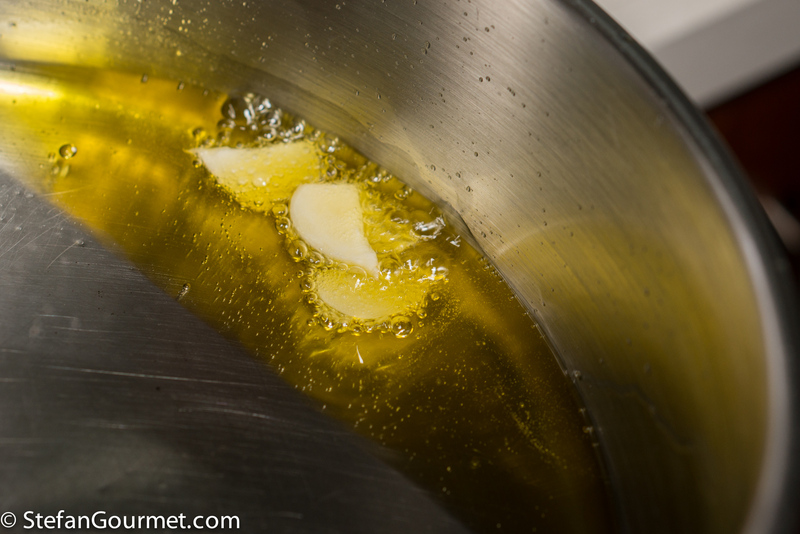 Add a sliced clove of garlic and tilt the pan to ‘deep fry’ the garlic until it starts to color, then remove it. 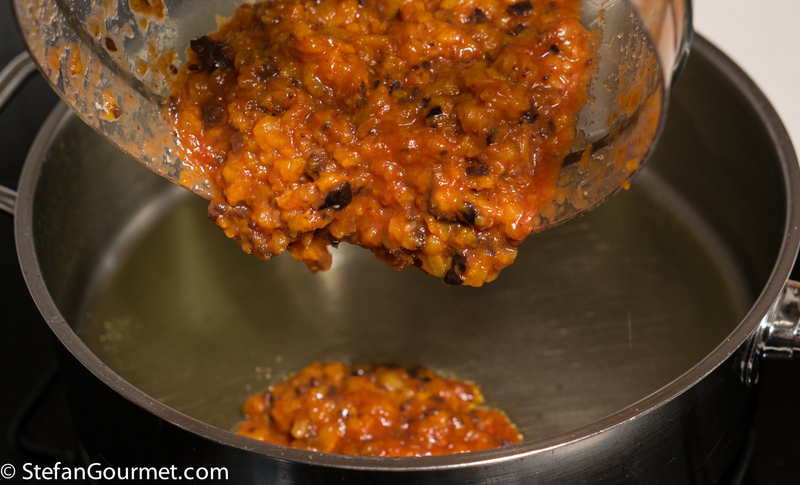 Add the bell pepper mixture to the garlic infused oil in the frying pan. Season with salt and freshly ground black pepper. 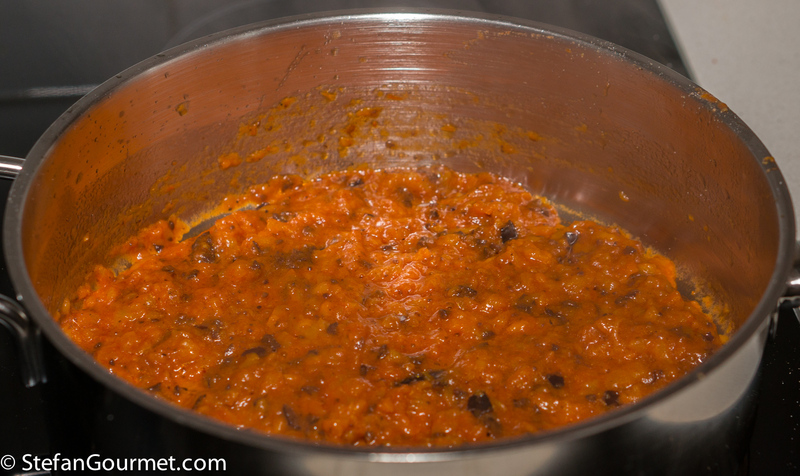 Cook for a couple of minutes over medium heat until the sauce is no longer watery. Taste and adjust the seasoning with salt and freshly ground black pepper. 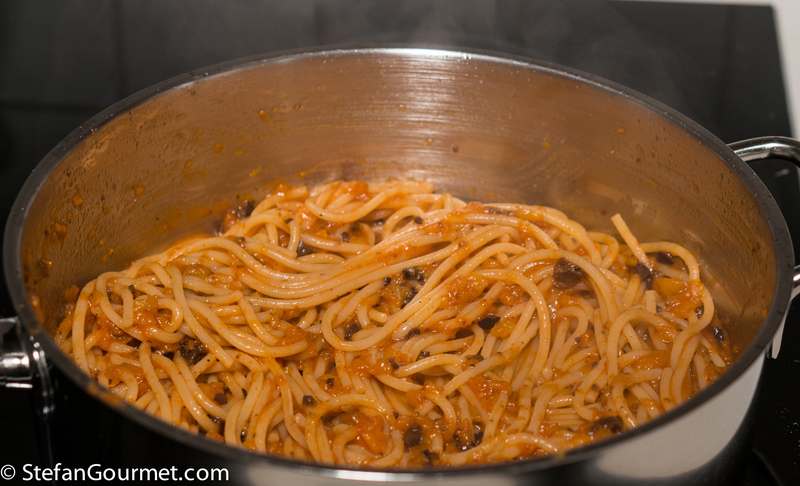 When the timer beeps, drain the spaghetti and add to the sauce. 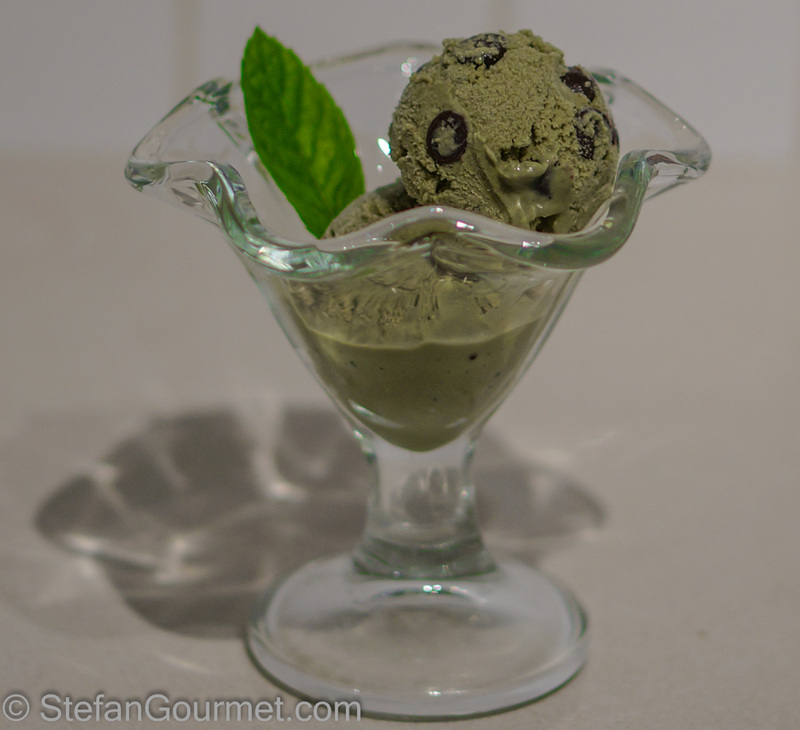 Homemade mint ice cream made using fresh mint leaves has an amazing flavor. Once you’ve made it, you’ll never go back to store-bought. You have made me think – and try – good! Can see the point!! Of course I should well and truly ‘shut up’ as I mostly cook Asian pasta and have also had a love affair with tagliatelle forever . . . besides that, Chinese chopsticks and I get together with almost any pasta as long as noone is looking 🙂 ! Easy to use with any sauce . . .
An easy and delicious meal, Stefan.